There’s a certain point in the lifecycle of renting where you say to yourself: I just can’t do this anymore. Maybe it’s the upstairs neighbors, who relentlessly stomp across their apartment into the wee hours of the morning. Maybe it’s the numbingly dull white walls you’ve stared at year after year. Or perhaps it’s that bitter pill of knowledge that your hard-earned money is circling down the drain—en route to paying someone else’s mortgage. No matter the reason, most of us eventually hit a breaking point with renting, and vow to become homeowners once and for all. But just because you want to buy a home doesn’t mean you should buy a home. 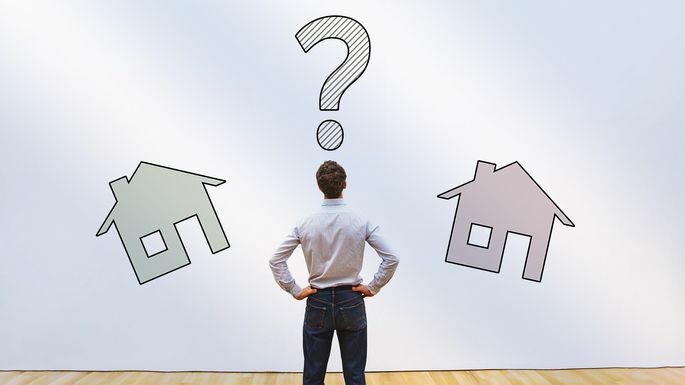 Even if you’ve already evaluated your finances and told yourself, “I can swing a down payment,” there are some additional key questions to ask to determine whether you’re ready. Here, we unveil some oft-overlooked, soul-searching inquiries that you really should ask yourself before you make the biggest financial commitment of your life. Ready? 1. Have I recently experienced a loss? If you’ve recently gone through a breakup, lost your job, or suffered any other kind of negative life event, you might feel like the answer is to start over. A reset can indeed do you a world of good, but taking on a mortgage probably won’t be the fresh new beginning you’re looking for. Even if you think you’re in a good place, emotionally speaking, Whitman warns that stress might cause you to subconsciously make your housing decisions out of fear. It’s better to wait until you’re past a situation and can know you’re making the best choice for you. 2. If I get a new job, will I have to move? The job market has changed drastically since the days when your parents bought a home, and you should know how that will affect you before you buy. Changing jobs won’t be a big deal if you can keep—or raise—your salary, and your new gig is in your current city. But if there aren’t a ton of jobs in your industry in your area, you may find yourself having to relocate a year after you bought your home. “It honestly isn’t a good idea to buy a house unless you plan on staying there for at least five years,” Crouch says. If you sell earlier, you may end up taking a loss on the deal. 3. Am I ready to write (a lot) of checks beyond the down payment? Here’s the good news: Mortgage requirements have been loosening since the credit crunch, and you may very well be able to buy with less than 20% down. But the bad news is that won’t be the end of your upfront costs. Hire a mortgage broker and you could pay a 1% to 2% fee on the amount of the loan. A home inspection will cost you a few hundred. Your closing costs could add up to 7% of the total cost of the home. And then there’s the Murphy’s Law of it all: If something can go wrong, it probably will. “If the air conditioner breaks a month after you close, or the dishwasher gives out, that’s now up to you,” Whitman says. If you don’t have the funds to cover your closing costs and a separate emergency account for the inevitable “just moved in” headaches, it might be better to wait until you do. 4. Am I OK with owing the bank lots of money for a long time? One of the biggest benefits of homeownership, of course, is the equity. Instead of handing all your hard-earned cash over to a landlord, you’re putting it back into your home—which you (hopefully) will sell for a profit down the line. But that equity doesn’t happen immediately. In fact, for many buyers, it takes time. Sometimes a long time. Unless you pay for your house in cash, you’ll be on the hook for not only your monthly mortgage payment but the interest on the loan as well. Stretching out your payments over more years—as with a 30-year fixed-rate mortgage—can help reduce (and stabilize) your interest charges. But it can be hard to pay down your principal when you’re constantly trying to cover other costs. It’s part of being a homeowner, and you need to decide if you’re good with it. “Anyone considering buying needs to look at an amortization schedule to see exactly how much out of their monthly payment will be going toward paying off the house,” Crouch says. 5. Is buying truly cheaper in the long run? This one depends quite a bit on where you live. So do the math. Understand that when you’re buying, you’ll be taking on a big down payment and all those additional costs. On the other hand, you’ll want to take a look at your local rental market. If your rents are increasing steadily year over year, you might be shelling out more on temporary housing then you would on your own home each month. And you may find yourself with your savings too depleted to buy. That could mean that buying, while a punch to the wallet now, will be more affordable in the long run. But if you live in a more stable rental market, it could be better to sock away some cash and wait a few more years to purchase a home. You can use our handy Rent vs. Buy Calculator to crunch the numbers and decide what’s right for you. 6. Am I secretly trying to talk myself into it? Your co-workers don’t understand why you’re still renting. Your friends are all buying their first homes. You’ve been saving for years specifically so you can buy a house and become a key-carrying member of the Great American Dream. It may seem like you should just buy already, but try asking yourself: Do you really, truly want to? Am I trying to sell myself on the idea of buying a home? Am I trying too hard to justify it financially? Do my reasons to buy outnumber my reasons not to buy? After all, buying a home is arguably the biggest financial (and, sometimes, emotional) commitment you’ll ever make. You need to be sure it’s right for you—no matter what anybody else says.